It is worth noting that there is no doubt that a power coating finish has a higher durability than that of liquid paint. The surface preparation and pre-treatment allows for the powder coating to adhere to the metal surface when compared to a traditional paint finish. The powder coat process starts with the powder particles being heated in a special powder coat oven. This intense heat causes the powder particles to gel together. There is a finish coat that is applied before the item is baked in the oven for the curing process. Traditional paint is applied wet and then is air-dried. The lack of heat means the paint doesn’t adhere to the product as strong. The thickness you get with powder coating is 4 to 10 times thicker than what you get with a traditional paint. Even when wet paint is applied thickly, it is still less thick than what you get with powder coating. Deep scratches that would show through wet paint don’t have the same effect on the thicker, more durable powder coating finish. Because powder coating is physically harder than traditional wet paint, it is much more resistant to scratching and chipping. This is one reason why powder coat finishes hold up best over time. One of the many benefits of powder coating is it can be bent without flaking or cracking. This is because it adheres to the products applied to. 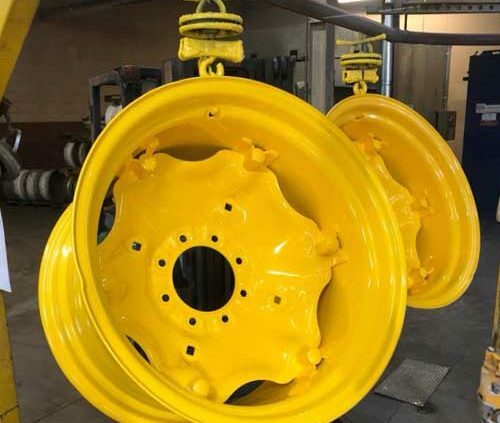 The involved process of pretreating parts, along with the curing process, is what allows powder coating to adhere better than paint. Materials that have been painted with powder coating they can withstand being exposed to the outdoor elements without coming loose like traditional paint does. As long as the item has been pretreated, and the powder coating processes have all been done correctly, the end result is a maximum resistance to corrosion that is far superior to wet paint.